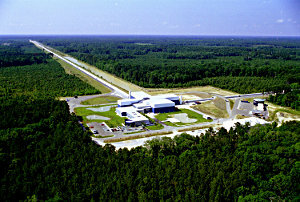 The Galaxy Evolution Explorer UV space telescope helped to identify red elliptical galaxies that also emitted the strongest UV. 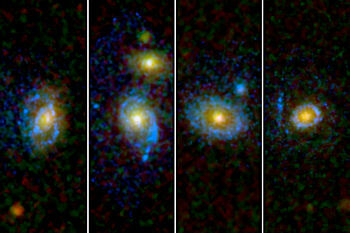 These are detailed, long-exposure Hubble Space Telescope images of four of these galaxies that capture the UV-emitting rings and arcs indicative of new star formation. The press release is available at http://www.galex.caltech.edu/newsroom/glx2010-03f.html. The full published article is “Star Formation Signatures in Optically Quiescent Early-Type Galaxies” by Samir Salim and R. Michael Rich, The Astrophysical Journal Letters 714: L290–L294, 2010 May 10. Hey kids! The roman god Jupiter (for whom the planet is named) drew a veil of clouds around himself to hide his mischief. Jupiter's wife, the goddess Juno, had the power to peer through the clouds and see Jupiter’s true nature. 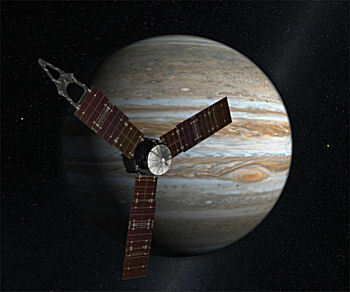 NASA’s Juno spacecraft, to be launched next summer, will also look beneath the clouds to reveal Jupiter’s mysteries. 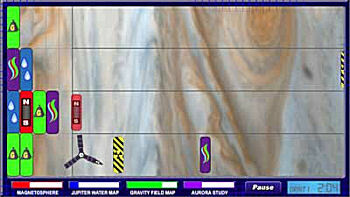 Get a Juno-view of Jupiter by playing the exciting new JunoQuest game at The Space Place, http://spaceplace.jpl.nasa.gov/en/kids/juno. Left-over cloud from the Tycho supernova, witnessed by Tycho Brahe and other astronomers over 400 years ago. This image combines infrared light captured by the Spitzer Space Telescope with x-rays captured by the Chandra X-ray Observatory, plus visible light from the Calar Also Observatory in Spain. Australopithecus squinted at the blue African sky. He had never seen a star in broad daylight before, but he could see one today. Was it dangerous? He stared for a long time, puzzled, but nothing happened, and after a while he strode across the savanna unconcerned. Millions of years later, we know better. That star was a supernova, one of many that exploded in our corner of the Milky Way around the Pliocene era of pre-humans. Australopithecus left no records; we know the explosions happened because their debris is still around. The Solar System and everything else within about 300 light-years is surrounded by supernova exhaust — a haze of million-degree gas that permeates all of local space. 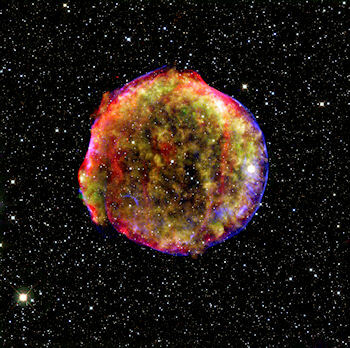 Supernovas are dangerous things, and when one appears in the daytime sky, it is cause for alarm. How did Earth survive? Modern astronomers believe the blasts were too far away (albeit not by much) to zap our planet with lethal amounts of radiation. Also, the sun’s magnetic field has done a good job holding the hot gas at bay. In other words, we lucked out. The debris from those old explosions has the compelling power of a train wreck; astronomers have trouble tearing their eyes away. Over the years, they’ve thoroughly surveyed the wreckage and therein found a mystery--clouds of hydrogen and helium apparently too fragile to have survived the blasts. 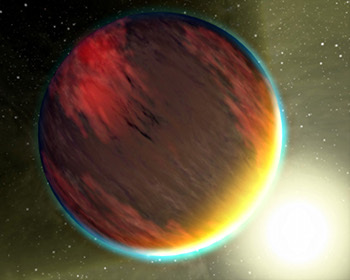 One of them, whimsically called “the Local Fluff,” is on the doorstep of the Solar System. NASA’s Voyager spacecraft may have found the answer. If fluffy clouds of hydrogen can survive a supernova blast, maybe it’s not so surprising that we did, too. “Indeed, this is helping us understand how supernovas interact with their environment—and how destructive the blasts actually are,” says Opher. Maybe Australopithecus was on to something after all. 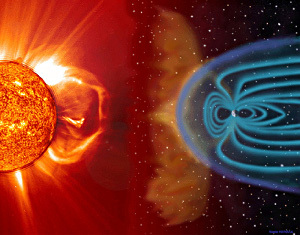 Opher’s original research describing Voyager’s discovery of the magnetic field in the Local Fluff may be found in Nature, 462, 1036-1038 (24 December 2009). The Space Place has a new Amazing Fact page about the Voyagers’ Golden, with sample images and sounds of Earth. After all, just in case one of the Voyager’s ever meets up with ET, we will want to introduce ourselves. Visit http://spaceplace.nasa.gov/en/kids/voyager. Opportunity spots a rock with its NavCam that its AEGIS software says meets all the criteria for further investigation. Fortunately, it is possible to teach old rovers new tricks. All you have to do is change their programming—and that’s just what NASA has done. Estlin and her team have been working for several years to develop and upload increasingly sophisticated software to the rovers. As a result, the twins have learned to avoid obstacles, identify dust devils, and calculate the distance to reach their arms to a rock. With the latest upgrade, a rock hound is born. The system was recently put to the test; Opportunity performed splendidly. The new software doesn’t make humans obsolete. On the contrary, humans are very much “in the loop,” setting criteria for what’s interesting and evaluating Opportunity’s discoveries. 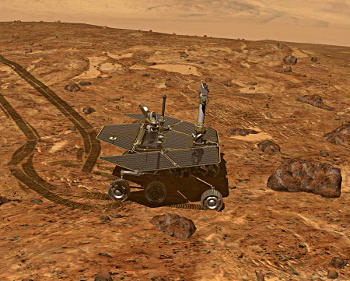 The main effect of the new software is to strengthen the rover-human partnership and boost their combined exploring prowess. Learn more about how the AEGIS software works at http://scienceandtechnology.jpl.nasa.gov/newsandevents/newsdetails/?NewsID=677. If you work with middle- or high-school kids, you’ll find a fun way to explore another kind of robot software—the kind that enables “fuzzy thinking”—at http://spaceplace.nasa.gov/en/educators/teachers_page2.shtml#fuzzy.